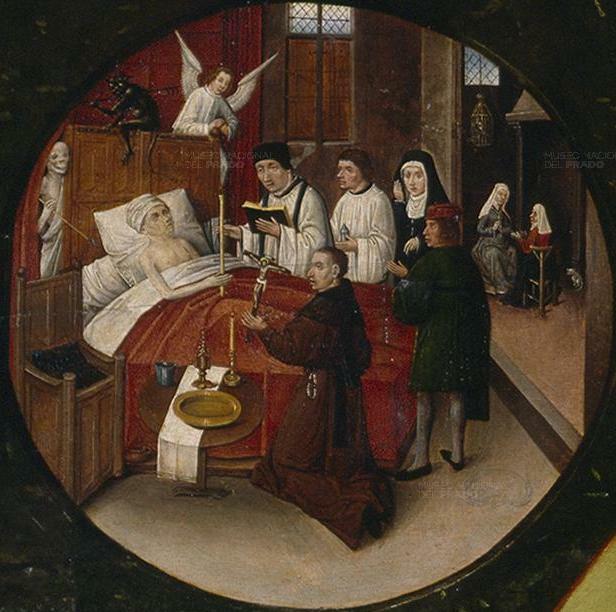 “Death of a Sinner,” part of The Seven Deadly Sins and the Four Last Things by Hieronymous Bosch, c. 1500. The Four Last Things are death, judgment, hell, and heaven. I know not everyone agrees, but I’ve always thought that leaving folks to die by the roadside is a sure turn toward hell. Update: I’m so happy to report that I was wrong, and that today, the Supreme Court upheld the constitutionality of the Affordable Care Act. I feel hugely relieved. Good analysis by MSNBC here. I’m writing this with the fearful expectation that the Supreme Court will rule tomorrow that the health-care reform law is unconstitutional. After all, they’ve once again affirmed their ridiculous and absurd assertion that corporations are people and that, therefore, elections are for sale. There are, as usual, much greater and more knowledgeable minds than mine that have weighed in on these issues in ways vastly subtle and complex. That’s fine, but I need to express my own sheer terror at what is coming. I am afraid, very afraid. The main issue that the radical right has trotted out to argue that the Affordable Care Act is problematic is that it requires people to purchase a “product” they may not want, or else pay a fine. As usual, the Republicans turn logic on its head in order to make many of the people this Act would help most think it will harm them or is unfair to them. The Republicans have a real knack for that. That certain elements in the Republican Party can sucker some of the public into believing their upside-down story is one thing. But that a Supreme Court judge might do so, much less the five that are likely to rule along ideological lines against the health care law, makes me frantic. Usually, I speak out about health care reform as something beneficial to people who, unlike me, do not have health insurance and who suffer, potentially even losing their lives, because of this situation. Usually, I present my support as a matter of compassion and fairness to those less well off than I am, less protected from the vicissitudes of health. Homeless and Cold by Ed Yourdon. This man is our stereotype of a person who needs charity healthcare. 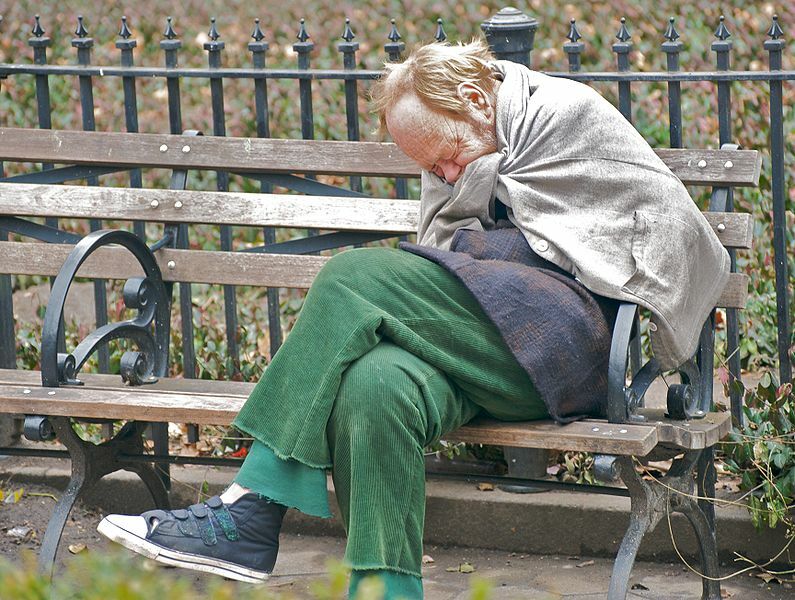 I’m fine with contributing to the care of such people, but unfortunately far more people besides those living on the streets are dying due to lack of healthcare. They’re just more hidden from view. * One of my former undergraduate students, a brilliant young man now in graduate school at NYU, suddenly in his senior year of college began having seizures. His working class parents had no health insurance coverage for him. I helped him find the resources to obtain health insurance, but he still carries the debt from a couple of hospitalizations and will carry it for many years to come. His entire future will be affected by this debt—his ability to buy a house, to provide for his children and their education, to start a business, etc., etc. He is not yet 25 years old. * One friend who worked independently as a hairdresser was suddenly struck with cervical cancer in her thirties. Because she had other well-educated and persistent friends who helped her navigate the system, she got help, but she will be paying the hospital off for the rest of her life. * My friend, a sweet and talented young woman who worked on an academic project with me—on grant funding without benefits—suddenly deteriorated into a psychotic state over a period of a few weeks. Several friends and her boyfriend rallied around and got her committed to the charity mental health hospital, where the only expertise anyone seemed to have related to drug and alcohol addiction. After her premature release due to a lack of health insurance, her boyfriend and brother took twelve-hour shifts watching her, but one night she managed to slip away. She went to a friend’s house—one who didn’t quite understand her state of mind—and after everyone went to bed, she tied a concrete block around her waist and drowned herself in a swimming pool. She should have still been in the hospital. * In November 2009, a man walked into an office building here in Orlando and shot six people, killing one young father. His mental illness had responded to treatment in the past, but, as his mother-in-law reported, after he lost his job and his health insurance, he couldn’t afford to pay for his medications and treatment. These cases have had a local impact on me, but they are not at all unusual. They happen on a daily basis all over the country. In a 2009 study by Harvard Medical School, researchers estimated that 45,000 deaths a year occur in the U.S. due to a lack of health insurance. That’s one every 12 minutes, and it doesn’t even count the ones like the young father who was murdered. These are my motivation for supporting universal healthcare and, short of that, Obamacare. However, as I have contemplated the purported unconstitutionality of the “individual mandate” for most Americans to purchase health insurance, I must admit that I see where the right wing is going now, and it makes me tremble with even more fear. I don’t really feel this way, but I could also add that I am very tired of having my own medical bills inflated to cover the costs of people who never pay theirs and who don’t carry health insurance to help them do so when it would be possible for them to do so. In other words, all of those people walking around with no health insurance are being carried by those of us who more regularly participate in the health care system. We have been paying for them for a long time. Democrats don’t emphasize this side of the argument, because they can see, I’m guessing, exactly what I’m seeing in the future. There are also plenty of Republicans who do have health insurance and what they say often is, “Just don’t force me to pay for someone else’s health care.” If the Affordable Care Act is ruled unconstitutional by the Supreme Court, then we are really opening ourselves up to a kind of divide that will allow more and more people to die. We are opening ourselves more and more to those who believe that if you don’t have health insurance, it must be your own “responsibility,” and that if you get sick that is somehow your own fault as well. Would that we could sort out those at fault and those not. But the Tea Partiers who don’t have health insurance are insane, that much I know. In other words, those radical elements in the Republican Party who have expressed their willingness just to allow the sick to die are going to get their way. That our high court may be laying the groundwork for this abandonment of the public good is appalling. I don’t know how anyone can support this political agenda. It is cruel, immoral, stupid, and Dark-Ages-like. I hardly recognize my own country in this debate. I’m a dedicated American, but this issue more than anything makes me wonder if I will always continue to feel that I belong here. It is far more subtle than the Holocaust, and the Rwandan genocide, but we are being set up for a slaughter nonetheless. 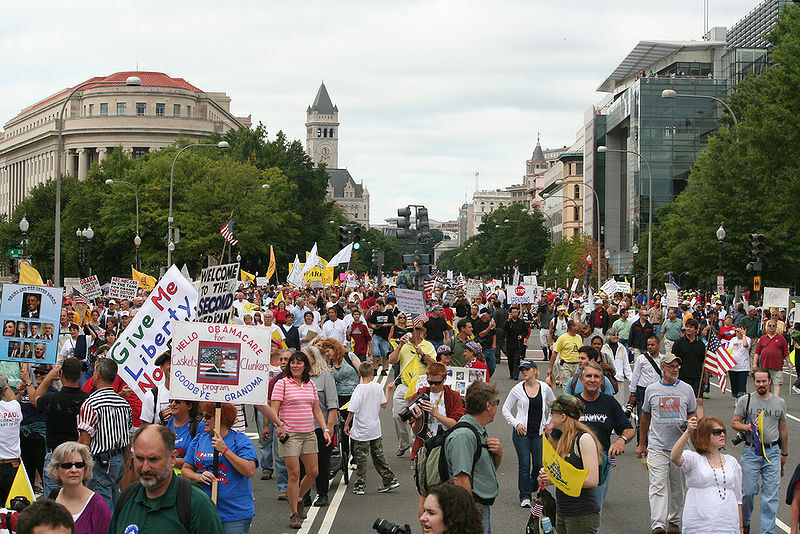 Tea Party march on Pennsylvania Avenue, Washington, DC, 2009, by Patriot Room. One woman sports a sign that says, “Hello Obamacare, Goodby Grandma,” an example of the kind of mischaracterizations (lies) so common on the right. Maybe we should determine admission to the ER without insurance based on voting records. I’m reaching the point where I’m ready for these folks to put their money where their mouth is and not receive healthcare if they don’t have insurance or the cash to cover it.